BioWare’s mammoth online game enlists a massive team of composers to create an authentic Star Wars soundtrack. But can they produce quality entertainment to rival John Williams? 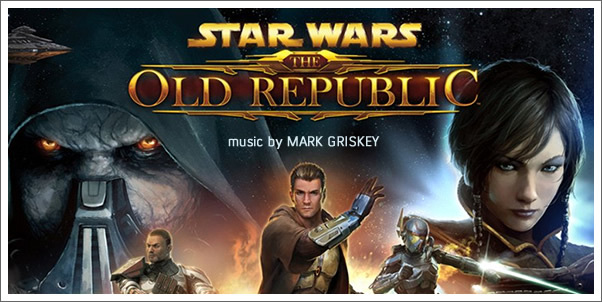 Lennie Moore, Jesse Harlin, Gordy Haab, Wilbert Roget II, Steve Kirk, Jared Emerson Johnson and Peter McConnell unite with MARK GRISKEY (composer of the previous game in the series, Knights of the Old Republic II) to conquer this task. The game, which was released in December 2011, is a Massively Multiplayer Online game created by BioWare - a studio renowned for their Mass Effect and Dragon Age games. Said to have cost $200 million to develop, Star Wars: The Old Republic is certainly one of the largest video games ever created. Players can create and customize their own character then jump right into this massive Star Wars universe with thousands of other online gamers. A soundtrack disc containing 17 tracks was released with the Collector’s Edition of STAR WARS: THE OLD REPUBLIC, and another 30 pieces were released online for free download. This totals a whopping 47 tracks of original music from MARK GRISKEY and his team. And as an avid follower of the game since its announcement in 2008 and a dedicated player since its launch in 2011, I’ve listened to every beat of the soundtrack to delusion. Here are my thoughts.